Annuals or biennials; sparsely hirsute basally, glabrous distally. Rhizomes absent. Stems (simple from base), erect, (not flexuous), unbranched or branched distally, (0.5-)1.5-5.5(-7) dm. Basal leaves (soon withered), not rosulate, similar to proximalmost cauline leaves, 4-15 cm. Cauline leaves (3-)5-20(-35), pinnately (5 or) 7-13(-19)-foliolate, sometimes appearing pinnatisect, lobe number similar to leaflets (middle and proximal ones 2-11 cm), petiolate, leaflets petiolulate, subsessile, or sessile; petiole (0.4-)1-3.5(-4.5) cm, base not auriculate, (often sparsely hirsute); lateral leaflets shortly petiolulate or sessile, (decurrent on rachis smaller than terminal, distalmost blades narrower, with fewer lobes or leaflets), margins entire or crenate; terminal leaflet (subsessile or petiolule to 1 cm), blade suborbicular, obovate to oblanceolate, or elliptic, 1.3-3(-4) cm × 6-25 mm, base often cuneate, margins entire, repand, or obscurely 3 or 5-lobed. Racemes ebracteate. Fruiting pedicels divaricate-ascending, (3-)4-10(-13) mm. Flowers: sepals oblong, (1-)1.3-2.3 × 0.5-1 mm, lateral pair not saccate basally; petals white, narrowly spatulate to oblanceolate, 2-3.5(-4) × 0.8-1.5 mm, (not clawed); filaments: median pairs 1.5-2.5 mm, lateral pair 1-2 mm; anthers ovate, 0.2-0.3 mm. Fruits linear, (torulose), (1.4-)1.7-2.7(-3.2) cm × 0.8-1.1 mm; ovules 40-80 per ovary; style 0.5-1 mm. Seeds brown, oblong to ovoid, 0.7-1.1 × 0.5-0.8 mm. 2n = 32, 64. Flowering Apr-Jul. Marshes, streams, swamps, ditches, seepage, springs, lake margins, mesic bottomland and upland forests, wet areas, ledges of sheltered bluffs, banks and shallow water of streams and spring branches, margins of crop fields, waste ground; 0-2800 m; Alta., B.C., Man., N.B., Nfld. and Labr., N.W.T., N.S., Ont., P.E.I., Que., Sask., Yukon; Ala., Alaska, Ark., Calif., Colo., Conn., Del., D.C., Fla., Ga., Idaho, Ill., Ind., Iowa, Kans., Ky., La., Maine, Md., Mass., Mich., Minn., Miss., Mo., Mont., Nev., N.H., N.J., N.Mex., N.Y., N.C., N.Dak., Ohio, Okla., Oreg., Pa., R.I., S.C., Tenn., Tex., Utah, Vt., Va., Wash., W.Va., Wis., Wyo. 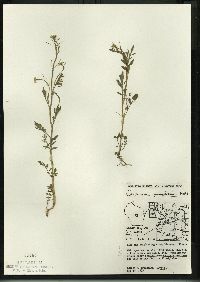 We have not seen material of Cardamine pensylvanica from Nebraska or South Dakota; it is very likely that the species grows in these states as well. 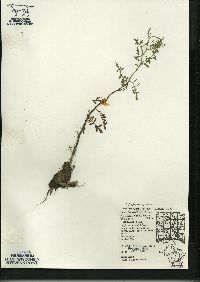 Annual or biennial herb with a weak taproot to 0.6 m tall Flowers: in a loose, branched cluster, stalked, white, 1.5 - 4 mm long. Sepals four, green. Petals four, longer than sepals. Stamens six. Fruit: a narrow pod, upright on an ascending stalk, 2 - 3 cm long, cylindrical, with a 0.5 - 2 mm long beak. Stems: multiple, upright or spreading, branched, green to purplish, round to angled in cross-section, hairy towards base (occasionally hairy throughout). Basal leaves: few or none at flowering, alternate, pinnately divided, stalked, to 10 cm long and 3 cm wide, with two to three pairs of lateral leaflets. Terminal leaflet 1 - 2 cm wide, leaflet reverse egg-shaped to orbicular, somewhat three-lobed. Occasional specimens may have marginal hairs along the leafstalks. Stem leaves: four to ten or more, alternate, pinnately divided, stalked, mainly 4 - 8 cm long. Terminal leaflet triangular to reverse egg-shaped, somewhat three-lobed. Lateral leaflets four to six, 3 - 8 mm long, broadly oblong to oval, sometimes one- to two-lobed, with their bases extending down along the leaf axis. Upper leaves have more leaflets than the lower ones. Occasional specimens may have marginal hairs along the leafstalks. Similar species: The similar Cardamine parviflora and C. parviflora var. arenicola are smaller and grow in drier habitats. Also, their terminal leaflets are about the same width as the lateral leaflets, and the leaflet bases do not extend down along the leaf axis. The stem leaves of C. hirsuta differ by having a marginal fringe of hairs at the base of their leafstalks. Habitat and ecology: Typically found in wet areas in various habitats. In the Chicago Region it has been found growing in moist wooded areas, often where water has stood earlier in the season. It also occurs in the springy portions of rich woods, mudflats, moist clay soil of fallow fields, and disturbed sandy fields. Etymology: Cardamine comes from the Greek word kardamon, which refers to plants in the cress family. Pensylvanica means "from Pennsylvania." Infrequent to frequent throughout the state in wet or moist soils. This species, like the next [Cardamine parviflora], prefers denuded or semidenuded areas, hence it is more abundant where it is found in moist, clay soil in fallow fields. It is found in wet places in woodland, ditches, and marshes, along streams, and about lakes. Sometimes the base is immersed in water when it may be mistaken for Nasturtium officinale or vice versa. The species may be separated easily by the size of the flowers. The calyx of this species is about 2 mm long and petals about 3 mm long while those of Nasturtium are about 3 mm and 4 mm long respectively. This species is very difficult to separate from the next. Most specimens are easily distinguishable by the habitat but we have specimens from moist, clay soil of fallow fields (the habitat of this species) that, so far as I can determine, belong to the next species. Contrary to my prejudice, I am compelled to recognize two habitats for the next species. Erect or spreading annual or biennial to 6 dm; stem usually hispidulous at least below, seldom glabrous; terminal lfl of basal lvs obovate to orbicular, 1-2 cm wide; cauline lvs commonly 4-8 cm, the terminal segment cuneate-obovate, the lateral smaller, broadly oblong to oval, 3-8 mm, usually decurrent on the rachis, entire or often with a few teeth or shallow lobes; pet white, 1.5-4 mm; mature pedicels ascending; frs ascending, 2-3 cm, the stylar beak 0.5-2 mm; 2n=32, 64. Swamps and wet woods; Nf. and Que. to Minn. and B.C., s. to Fla. and Calif. Apr.-June. Small pls of drier habitats approach C. parviflora.